Stiff Sunflower, Helianthus pauciflorus Nutt. 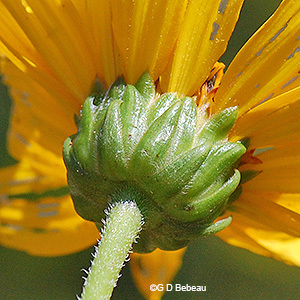 Stiff Sunflower is a native erect perennial forb, growing to 6 feet high. Stems have stiff erect whitish hair, are usually green with some reddish tinges in partial sun locations, more reddish in very sunny spots; they are usually unbranched except sometimes branched in the floral array. 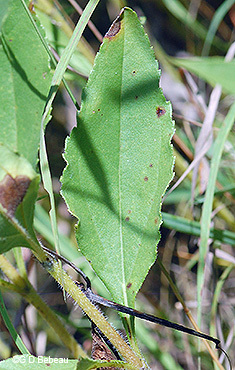 The leaves are mostly basal; those on the stem are opposite on the lower and mid-stem and sub-opposite to alternate in the very upper part. Leaves on the upper stem are widely separated. The shape is lance-ovate to oblong lanceolate with 3 prominent nerves near the base. They taper to the top and taper to a wedge-shaped base forming a short partially winged stalk on the lower leaves, less than 1/2 inch long, and shorter on the upper leaves. 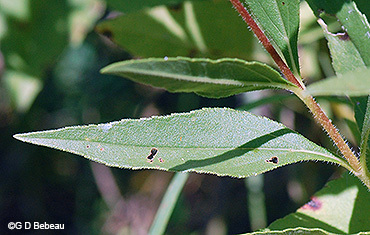 Upper leaves can appear slightly folded toward the mid-vein. Leaves can be up to 10+ inches long and 2-1/4 inches wide. They are thick, rough, with short hair on the underside veins and on the margin, stalks hairy. Margins vary from toothed to shallow lobed (undulating). The upper stem leaves are usually in an ascending position. The flowers are composite, about 2 to 3 inches wide, consisting of an outer ring of 10 to 20 ray florets with yellow rays, which are 20 to 25mm long, gland dotted on the back side, and not fertile. There is an inner disc of 75+ bisexual fertile disc florets whose corollas are tubular with reddish lobes (usually, sometimes yellow). The five stamens have dark anthers and there is a branched style - the branches yellow; stamens tightly surround the style and when the floret opens, both are exserted from the corolla and the lobes reflex. Disc florets open from the outside of the disc first. The flower head is hemispheric in shape with the outside composed of 25 to 35 phyllaries, in several overlapping series, ovate in shape, appressed, with pointed tips and margins that have very fine hair. The outer surface may be smooth to hairy. Seed: Mature flowers produce a dry deltate shaped cypsela, 5 to 6 mm long, with a pair of awl-shaped awns on the top, which quickly fall away, and from 1 to 4 smaller scales. Like most seeds of Helianthus these require at least 30 days of cold stratification for germination. Subspecies: There are two - see notes at page bottom. 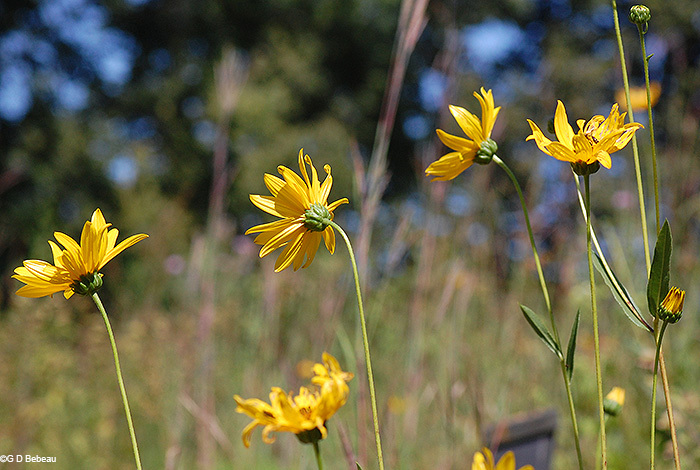 Habitat: Stiff Sunflower will be found in areas where it has full to partial sun and dry conditions - dry mesic to dry - prairies, roadsides, open woods. It is somewhat drought tolerant. It grows from a rhizomatous root system that can aggressively spread forming a colony of plants. It blooms early in some areas compared to other sunflowers, but in south-central Minnesota it blooms with many others. 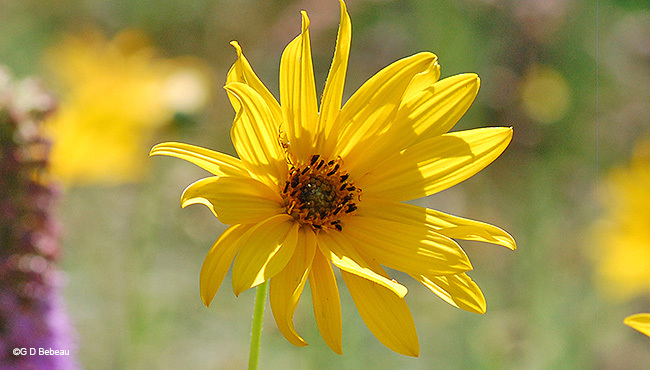 Names: The genus Helianthus is from two Greek words, helios for 'sun' and anthos for 'flower'. The species pauciflorus is from the root pau'cus meaning 'few', and florus for 'flowers' meaning 'few flowers' referring to the low number of flower heads per plant. The author name for the plant classification, ‘Nutt.’ is for Thomas Nuttall (1786-1859) English botanist who lived and worked in America from 1808 to 1841. On his many expeditions he collected many species that had been originally collected by Lewis and Clark but lost by them on their return journey. He also collaborated with French botanist Francois Andre Michaux (1770-1855) in Michaux’s 3 volume North American Sylva. Older synonyms for this plant are Helianthus laetiflorus and Helianthus rigidus. Comparisons: Stiff Sunflower resembles Jerusalem Artichoke, H. tuberosus, in height, hairy reddish stem and flower size, but the Artichoke has a tuberous root system, phyllaries more linear and the lack of reddish tints to the disc floret corollas. The two plants are known to hybridize. Due to the similarity of common names, one must also consider the Stiff-haired Sunflower, H. hirsutus where the stem is also hairy and reddish, but there the phyllaries are lanceolate in shape and spreading, and the disc florets are never reddish. The other species of Helianthus found in the Garden are: H. hirsutus, Stiff-haired Sunflower; H. strumosus, Pale-leaf Woodland Sunflower; and Helianthus giganteus, Giant Sunflower. 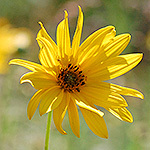 Above: The flower head of Stiff Sunflower on its tall stalk. Many plants have just one head. 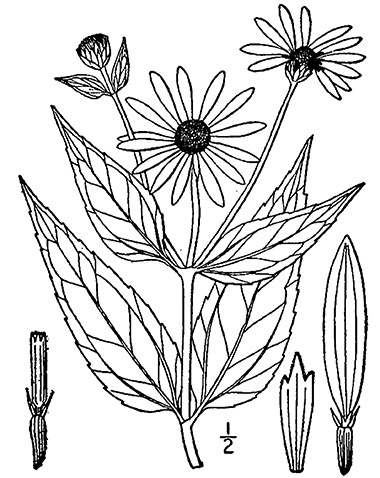 Drawing from Britton, N.L., and A. Brown. 1913. An illustrated flora of the northern United States, Canada and the British Possessions. 3 vols. Charles Scribner's Sons, New York. Below: Ray florets number 10 to 20 with 20 to 35 mm yellow rays. Below: 1st and 2nd photos - two views of the disc florets have reddish tints to the corolla lobes. Anthers and appendages are dark, while the two style branches are yellow. 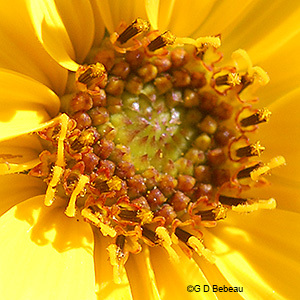 3rd photo - the phyllaries are more ovate than most species of Helianthus. They have fine hair on the margins and on some plants the outer surface many have hair. 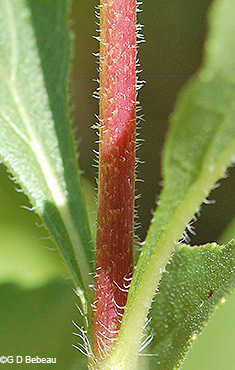 Below: 1st photo - The stem is reddish in full sunlight, with stiff erect hairs. Note longer hair on leaf stalks. 2nd photo - leaves in the upper part of the stem tend to an ascending position. 3rd photo - Typical leaf shape with undulating margin resembling shallow lobes. 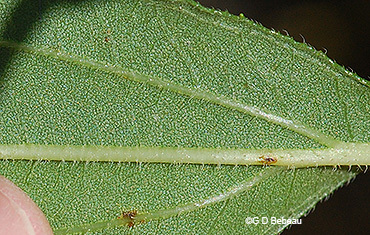 Below: 1st photo This leaf shows some serration. 2nd photo - Leaf underside with fine hair on the ribs. Notes: Stiff Sunflower is not indigenous to the Wildflower Garden. Eloise Butler first planted it in 1914, with more plants in '15, '16, '20, and 1931. She used the older name Helianthus laetiflorus. In 1917 she noted planting Helianthus subrhomboideus which is now a subspecies of H. pauciflorus. 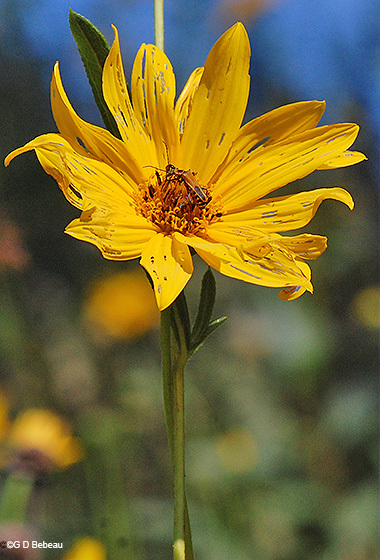 Martha Crone did not note planting it, but it was on her 1951 plant census under the name Helianthus rigidus. 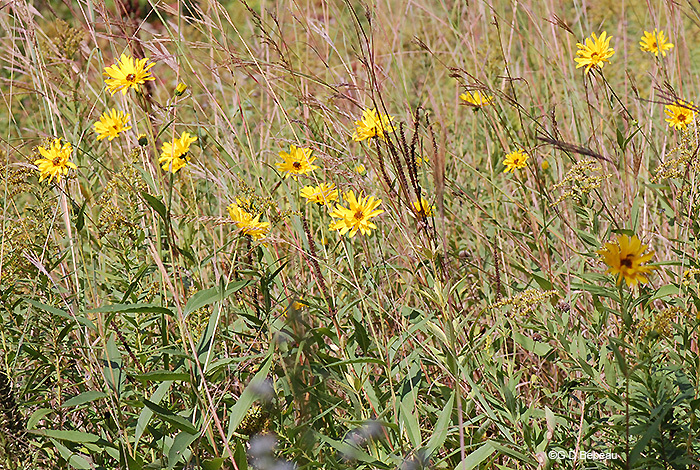 Within Minnesota Stiff Sunflower is found in the majority of counties with the exceptions widely scattered. 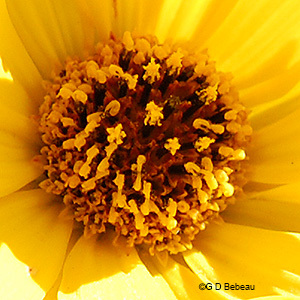 There are a total of 12 species of Helianthus native to Minnesota. It is widespread in North America east of the Rocky Mountains being found in the Southern Canadian provinces and in the United States except for some of the southeast states and Ohio and West Virginia. Subspecies: Two are accepted: H. pauciflorus var. 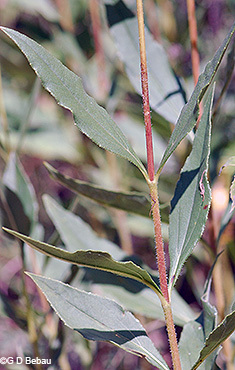 pauciflorus which has alternate leaves just at the very top and the leaf blades are oblong-lanceolate to lance-ovate, with pointed tips. Subsp. subrhomboideus has all opposite leaves with blades rhombic-ovate to lance-linear and acute or obtuse tips. Both subspecies are known in Minnesota and with some hybridization.